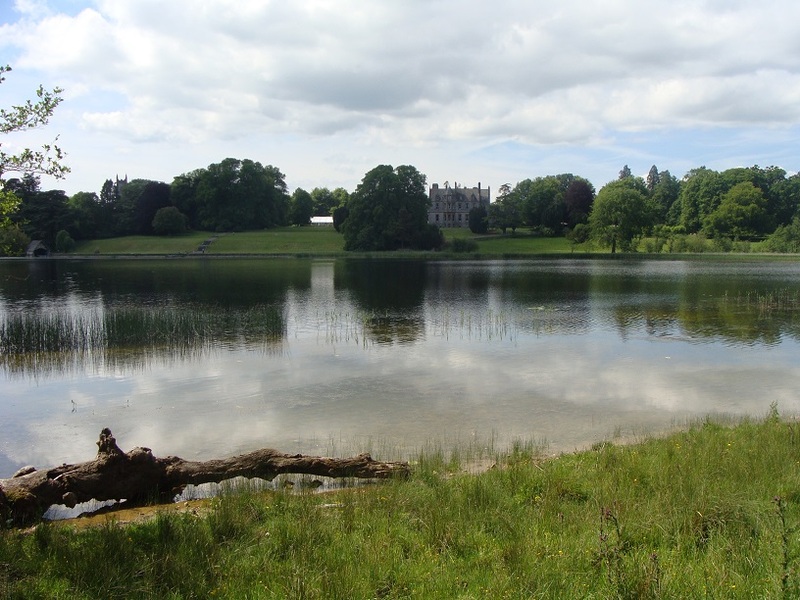 This blog is written by Hannah Moss following her visit to Castle Leslie in June 2015. After a very early start, I arrived at Birmingham airport. My flight was on time and I departed for Belfast International. I was surrounded by business people in their suits popping over to Ireland for a meeting. On arrival into Belfast Airport, the first thing that struck me was how small it was; the arrivals hall is in the baggage collection area. Jenny, the stables yard manager was collecting me and it was nice to see a familiar face (I had previously met her when she came to join us on our stand at Badminton Horse Trials). 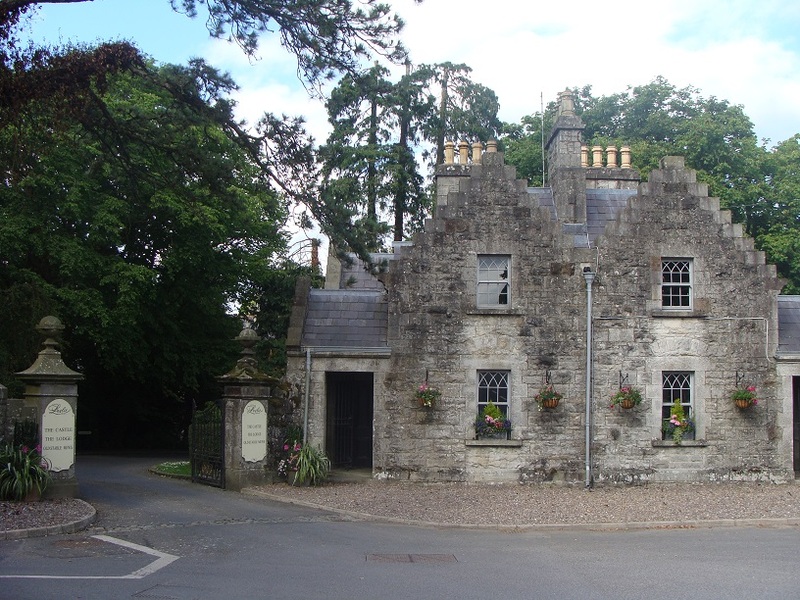 It’s just 1.5 hours’ drive from the airport to Castle Leslie. Jenny said ‘I bet you’re hungry!’ which I was so we stopped at a lovely café in Monaghan. I was ready for my bacon sandwich! As we approached Castle Leslie, Jenny pointed out the stone walls which surround the estate. A lot of the walls are falling down but there is a huge project to try and restore them and the part they have already completed looks lovely. We drove straight to the Equestrian Centre. The gate house by the equestrian centre is lovingly restored and now lived in. On arrival everyone was so friendly and welcoming, I went to meet Tina in the office and Jenny’s assistant Patrick. First impressions were a busy working yard! 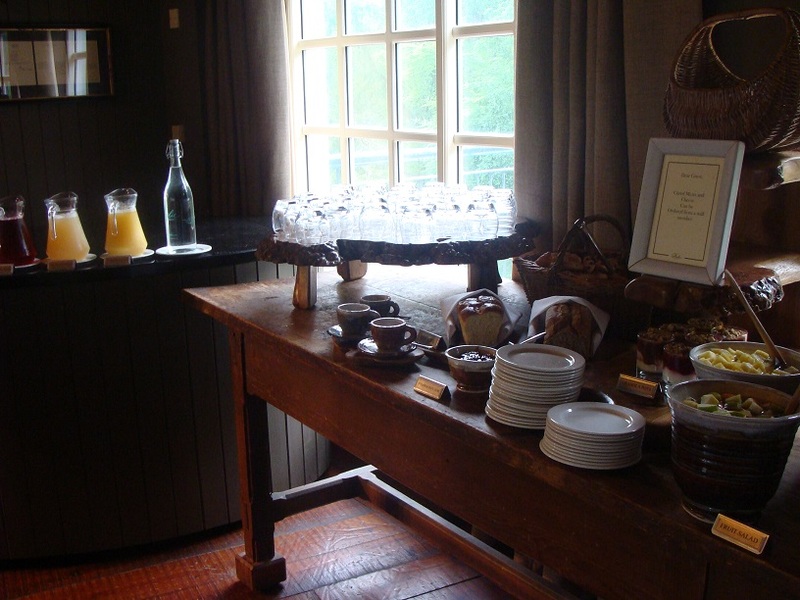 I was shown to the reception in the Lodge, which was really easy to get to from the stables. Through a door up off the stables, up the stairs, past an amazing boot room and then into reception. A lovely lady welcomed me and luckily my room was ready early so I was shown to it. I was in a room called Frosty (all the rooms are named after past and present horses on the yard). My room was amazing!!!! I had a massive king size bed, sofa, 2 chairs, tv, walk in shower, roll top bath etc. I felt like a queen. I had about 30 minutes before I was due to ride, so I got changed, unpacked and made my way down stairs to the yard. I was introduced to my instructor Jen for my one hour introductory lesson. 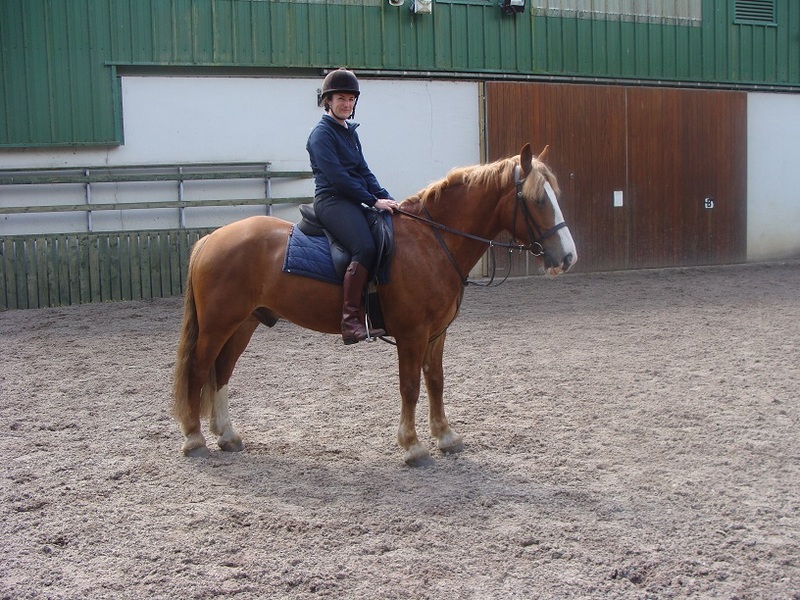 I was riding Trigger, a lovely looking 15hh Chestnut Gelding. We went to the outdoor school which was nice as the sun was shining. In my lesson Jen asked me what I wanted to work on. I said I wanted to work on my position and see what Trigger was like. Jen was really nice and chatty and we chatted about her hunting in Ireland and the thoroughbred mare she owns. Trigger was sweet, very well behaved and responsive. 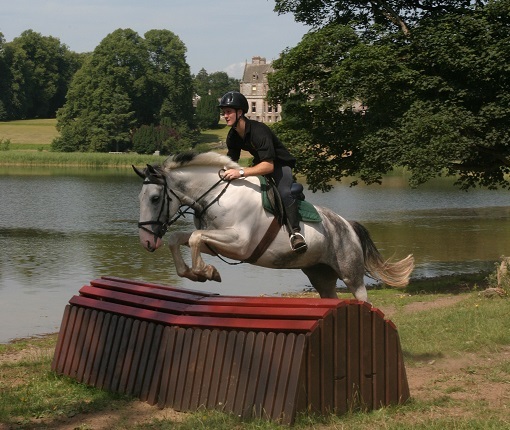 A nice horse to start my riding at Castle Leslie and break me into all my riding and lessons I am going to have. After my lesson I had two hours to spare before my estate ride at 4.15. 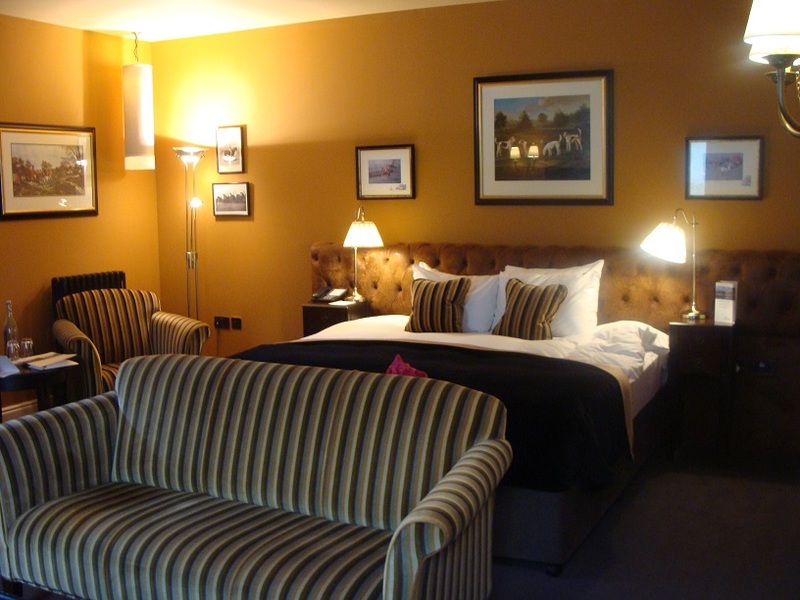 I went back up to my room and relaxed in the lovely armchairs which are positioned to take in the views from the windows. The rooms are a real selling point to this ride; they are spacious and luxurious. Later I made my way down to the yard for my next ride. I was a little early so I had a walk around the stables. All the horses were on shavings and all had hay and automatic water drinkers. There are a lot of horses on the yard but they all looked well cared for and happy. 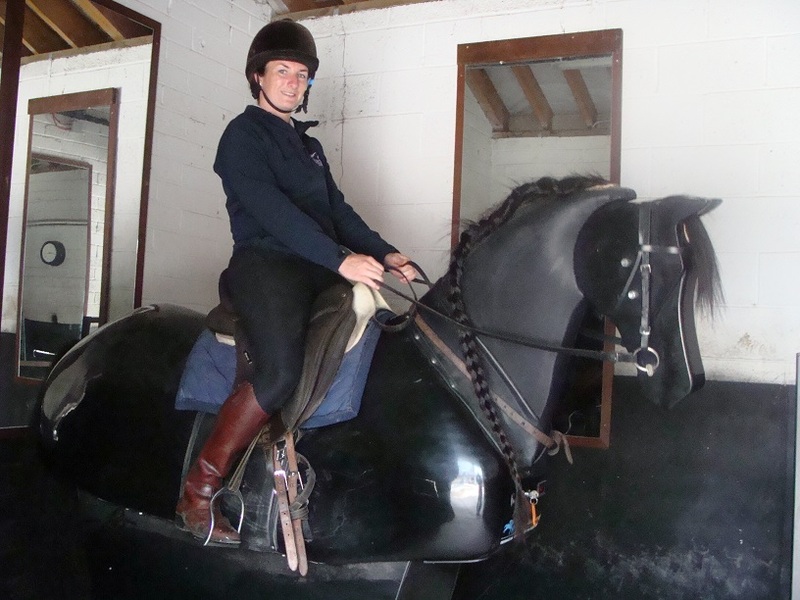 Jenny found me and suggested I have a go on Prince – the mechanical horse!! It was not at all like I imagined it to be. It’s trot was like a 12.2 pony and its canter the most collected and slow canter ever (I wish I could collect my mare at home like this!). Jenny introduced me to Lucy, a nice bubbly girl who has been working for Castle Leslie for two years. My horse for the estate ride was called Blue a 16.2 weight carrier and about 15yrs old). Blue was a bit grumpy and liked to pull faces at Two Tone who Lucy was riding but at least that was all he did. He was a gentleman to ride and definitely knew his job to look after me. Our estate ride took us past the Castle, Old Stables Mews and through the wood. The estate is so lovely and well maintained. I really enjoyed seeing all the different buildings from horse back. We had some long trot and canters along the tracks in the wood and occasionally we had to slow down back to a walk to pass other guests on foot walking along the paths. We rode down to the famous Glaslough lake. It is really beautiful with the little boat house and the Castle overlooking it. 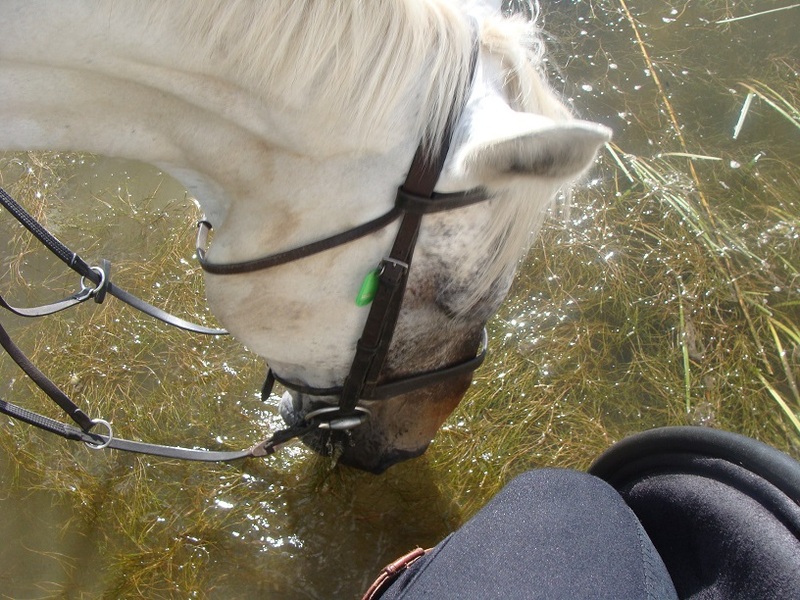 Our horses were thirsty and had a long drink in the clear water. Lucy asked me if I would like to go for a canter through the lake. It was great but I got soaked through! Showered and changed I made my way to Connors Bar, a relaxing bar with lovely private seating areas, for dinner. I enjoyed seeing the nice pictures of the Castle and grounds on the walls and in the one area there were lots of stag’s antlers, which I presume may have been from the estate. The bar was quite busy but I found a seat and chose my food, I was spoilt for choice. BBQ ribs to start followed by chicken in a white wine sauce. My food came quite quickly and was very well presented. It was much nicer than normal bar food that I am used to and it tasted great! I didn’t hang around this evening, I couldn’t wait to get into my enormous bed and catch up on my early morning start. I slept really well. I wasn’t due to ride until 11:15 so it felt really strange being able to have a lie in (I am usually up at 5am every morning). 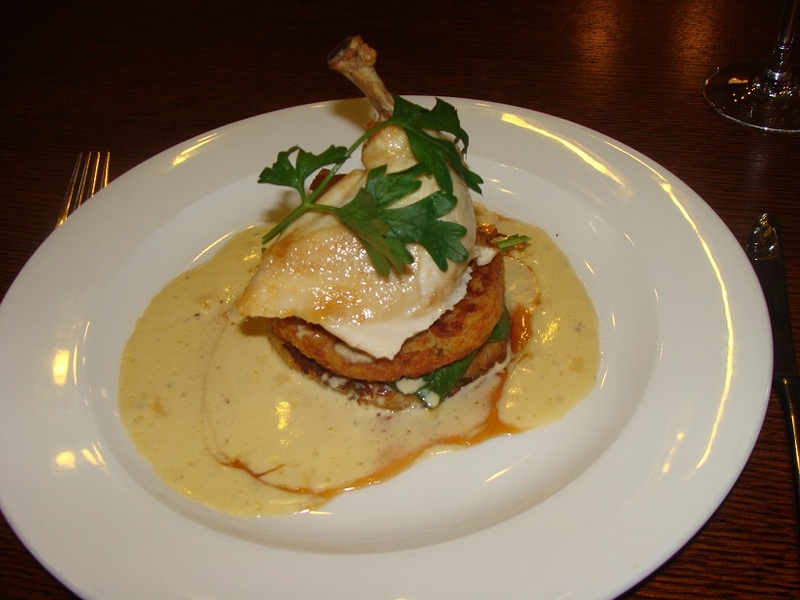 I went for breakfast which is in Snaffles Bar and served from 8 – 11. There was a good choice of cereals and salads etc which you could help yourself to. I ordered some scrambled egg, which was obviously made from free range eggs as it was so yellow and tasty. This morning I was to have a one hour flat lesson. My lesson was taken by Jen again and I rode a piebald gelding called Ken. There was also an American man joining the lesson who happened to also be called Ken! Horse Ken was sweet, more well-schooled than Trigger, the horse I rode in my assessment lesson yesterday. 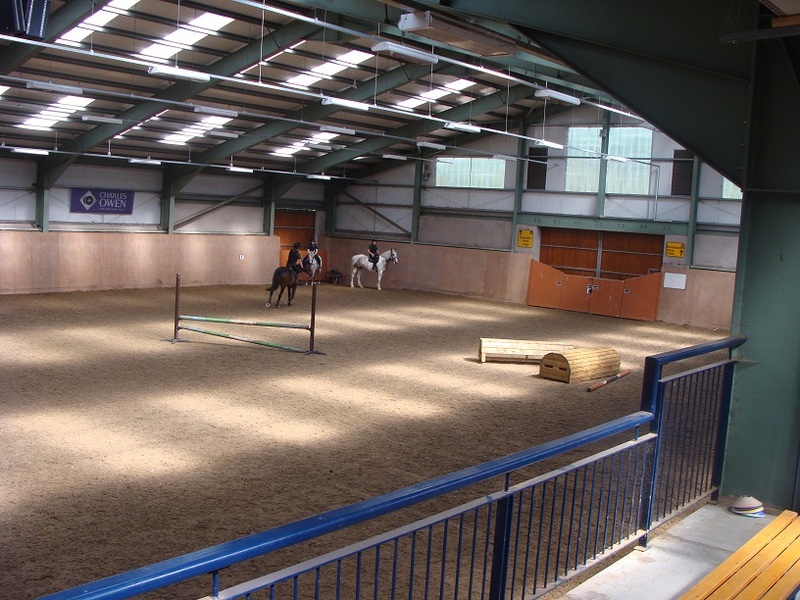 We were in the indoor school which was pleasant as it was really warm out in the sunshine. Our lesson was very structured and flowed well. We worked on control and circles and I worked on improving Horse Kens way of going especially in the canter. After my lesson I had some lunch in Connors Bar. I found a table outside in the court yard – a real suntrap. I was ready for the enormous chicken sandwich I had ordered which came with potato chips and salad. No rest for the wicked, at 1.45 I was on the yard for my two hour estate ride. I was introduced to my new steed called Bumble. She was a fairly young, lemon and white lovely Irish mare. I fell in love with her and could imagine she would be amazing on the hunting field. A nice example of a good Irish cob! Lucy was our guide and we had an Irish couple joining us who had travelled up to Castle Leslie in the morning. Our ride was lovely. We rode through the forests on the estate and also along the river. I found out the couple were staying at Castle Leslie for two nights and were staying in the Lodge tonight and the Castle tomorrow. At 4pm I met up with Eimear who is the sales and marketing manager at Castle Leslie. Eimear showed my around the estate so that I could see all the different accommodations including Stable Mews and the Village houses. It was lovely to see the castle and how beautifully furnished it is. Lord Jack Leslie’s niece Sammy is behind all the renovations and decorating and she has a very good eye for it. The Castle was amazing to look around and so different to the Lodge. Tonight Jenny and Patrick met me in Connors Bar for a meal. I had the BBQ ribs and chips (I could eat these ribs every day, they are delicious!). Another good night’s sleep – I am going to miss this massive bed. I had a telephone call to my room at 8am from Jenny asking me if I wanted to join the group on the cross country course. I was initially just going to watch them but the offer to join the ride was great and I definitely saw a lot more of the estate than I would have done on foot. I was assigned a skewbald called Cindy, I later found out she was only 6 but you wouldn’t have known as she had a very grown up head and was very good on the cross country. Jen was teaching and there was six of us in the lesson all of various abilities. 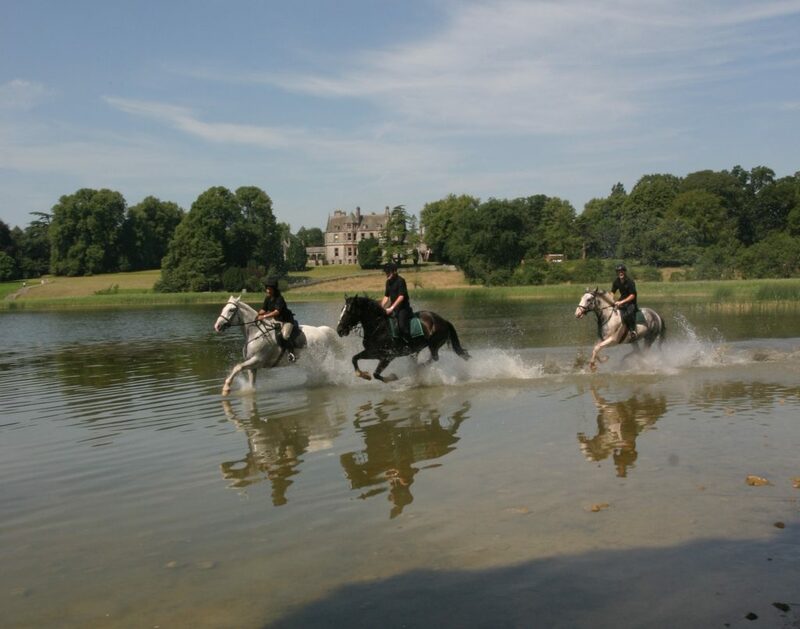 We went for a little hack around the estate first so everyone could get accustomed to their horses. I was wondering at this point how on earth I was going to get Cindy over the jumps as she was quite lazy! However once we reached the cross country Jen passed me her stick and we were away then! 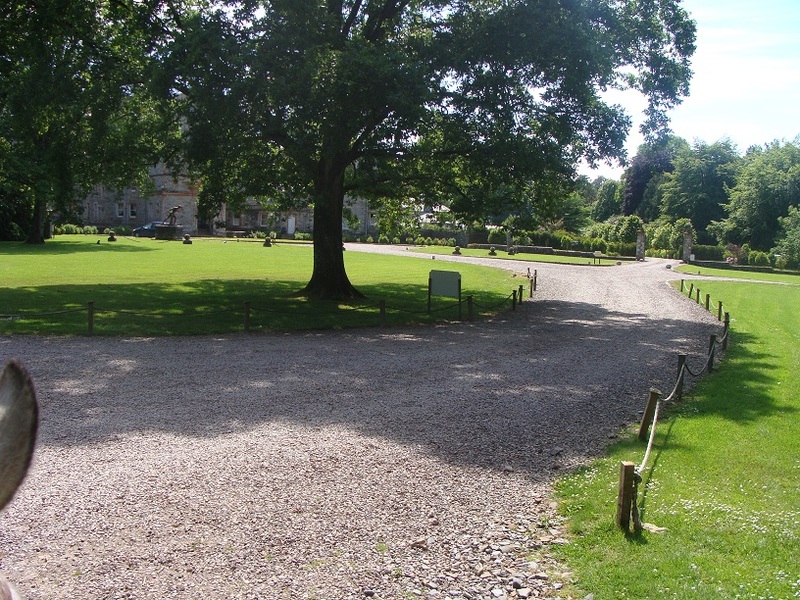 We were in the big cross country paddock which is located at the bottom side of the village houses besides the lake. 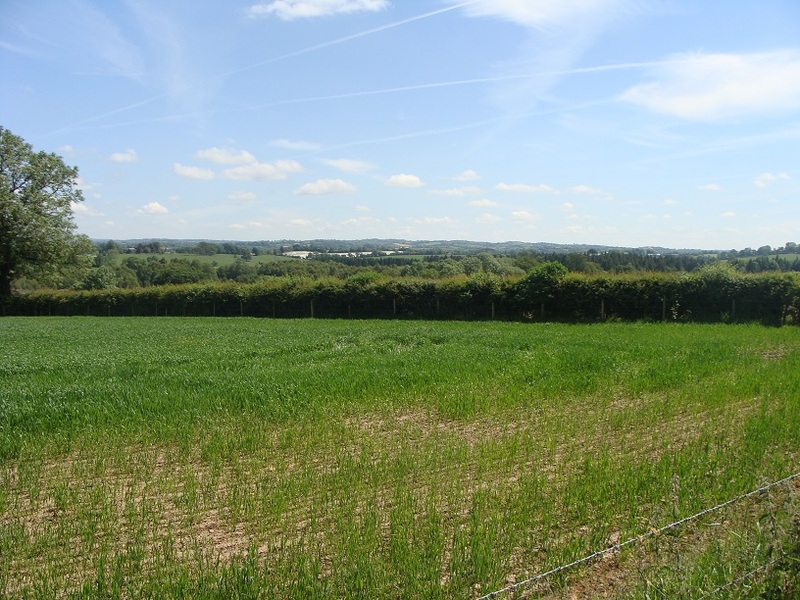 Jenny had previously told me they are constantly trying to improve this field with adding jumps and keeping the take offs and landings maintained. It certainly looked well maintained with mowed grass tracks and all the jumps in good condition. 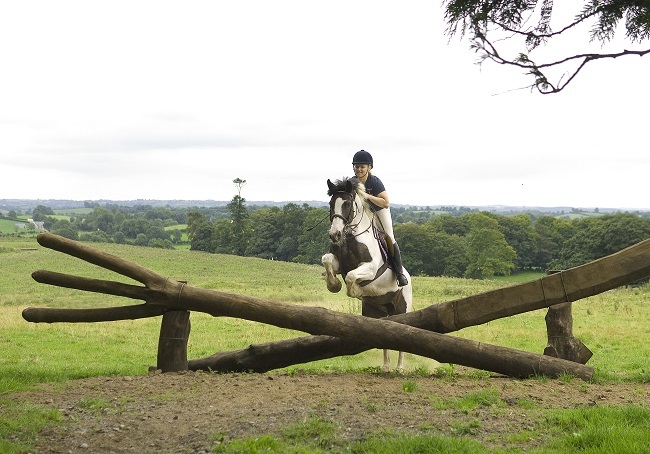 There was a huge array of jumps of all kinds ranging from tiny logs you could trot over to bigger jumps and combinations. All the horses in my group were extremely genuine and definitely knew their job without being boring. I think everyone in the group enjoyed the lesson and learnt lots. After the lesson I helped untack Cindy and put her tack away and then headed for a quick lunch. I was riding again at 1.45! Today I had a cheese and ham sandwich which was just as delicious and big as the one yesterday. I met the couple I had ridden with on the estate ride the previous afternoon. They had been in the spa all morning relaxing and said they thoroughly enjoyed it. They had a good night in the lodge and couldn’t wait to see the castle. 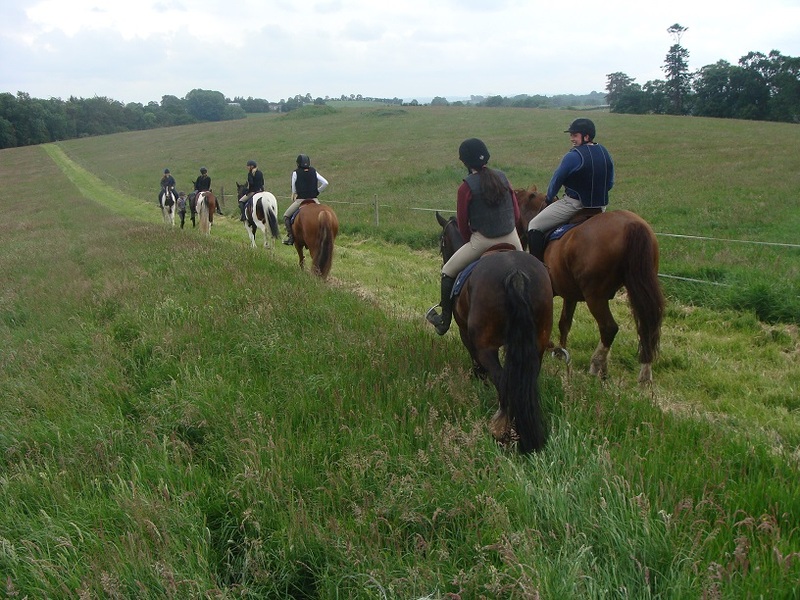 My estate ride this afternoon was with Lucy and we were joined by an Irish lady who was staying the night at Castle Leslie with her non-riding husband. The lady had not ridden in a long time and although she was a little rusty at first she quickly got back into the swing of it. I was riding a massive grey horse called El Hoff. 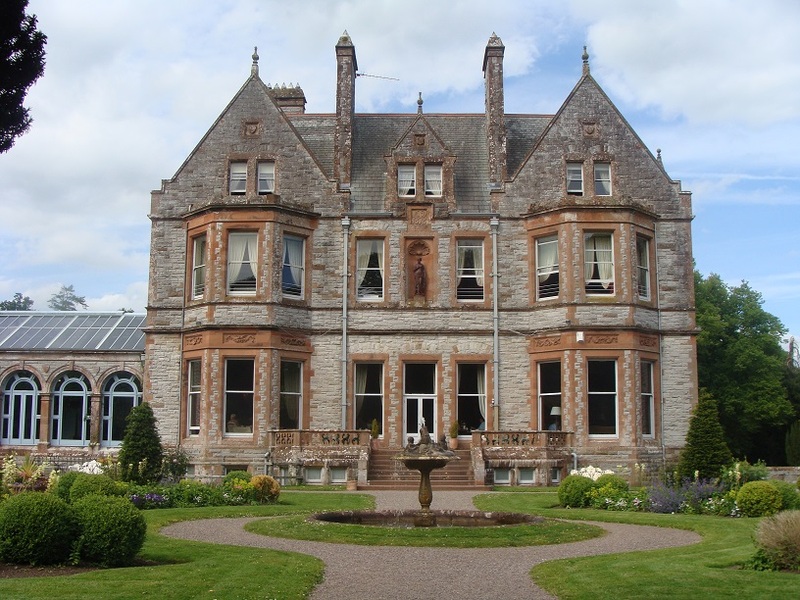 He was an old boy who had been at Castle Leslie for many years, but he was in great condition. El Hoff was great fun and experienced riders would really enjoy him. He was forward going and knew all the canter tracks over the whole estate! By the end of my day I was ready for an early meal and night. It had been another filled day. I made my way to Connors bar for my meal and had prawn cocktail to start followed by steak. All the food I have eaten has been far more superior to regular pub food. Tonight I met Carl who is the Castle Leslie estate manager. He had been very busy today up on top of the Castle inspecting the roof with a crane. A very nerve racking job he told me. He seemed passionate about Castle Leslie and obviously a hardworking man as he had another meeting this evening. Today I woke up early to get packed up. I went for breakfast in Snaffles restaurant and then made my way down to the yard. I managed to grab 15 minutes with Jenny to go through any outstanding information I needed to gather. She’s a very hard working lady and such a credit to Castle Leslie. She never stops; the stable yard is immaculately clean and all the lessons and rides flow like clockwork. I was joined on my final estate ride by four other riders. I had a different guide this time called Erinna. She had been on holiday and so it was lovely to meet her before I left. She was very knowledgeable about the estate and looked after us well. My ride today was only for an hour and I rode Two Tone who I had been admiring all week. He has very unusual head markings in the fact that he is a grey horse but has a dark brown side to his head. He was a wise old man and lovely to ride. Two Tone is one of the two horses used for the side saddle lessons. After my ride I went for some lunch and then waited in reception for the driver to take me to the airport. My driver was very punctual and polite pointing out local attractions on the way to the airport. Belfast International airport is very small. I was slightly early for my check in so I had a cup of tea in the only café. Once I had checked in I made my way through security to wait for my flight which left on time.